A standard vertical desk organizer works great for storing flat items—including cutting boards, cooling racks, and cookie sheets—in your kitchen for easy access. Place the desk organizer sideways inside a kitchen cabinet, then fill it by sliding the trays in from the side. A tiered desk organizer also works, and makes it easy to see everything at once. 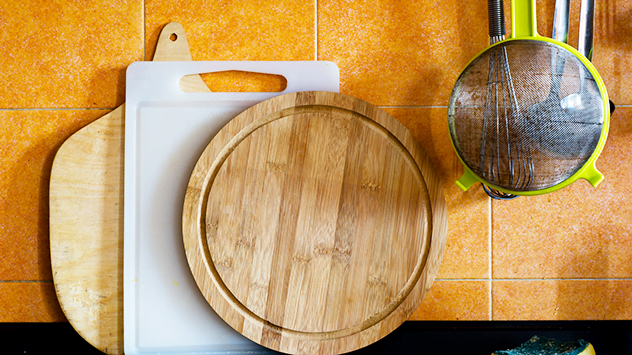 Joe Truini: One of the biggest challenges in kitchen storage is how do you neatly store and organize large, flat items—such as cutting boards, cooling racks, cookie sheets—items such as that. Well, we’re going to be thinking a little outside the box, and we’re going to use a desk organizer. This is a vertical file that’s typically used to hold books and notebooks and paper files, but we’re going to use it for storing these items. You can just set them in place, you can see there’s plenty of room—you could store three in each compartment. In this case we have enough—we have four compartments, but you could really load that up. And the really nice thing is that they store—the rack itself will store—not only in the cabinet, but also on the top shelf, so it’s completely out of the way. And then you can just load in your items—they load from the side. And then you can slide them in and take them out very easy. Now, I want to show you another one—another organizer that you could buy—which is a tiered organizer. And you see, it’s higher in the back. And the nice thing about this is you can see what’s in the back. So if you have a tall cutting board, and then cookie sheets in the front, you can stack them up so you can see in the back. With these two storage ideas, you can organize your cabinets in no time at all.